How to set aliasses in the Git Bash for Windows? How to alias command in Git Bash for Windows downloaded from git-scm.com ? I mean Bash commands not Git. I had the same problem, I can't figured out how to find the aliases used by Git Bash on Windows. After searching for a while, I found the aliases.sh file under C:\Program Files\Git\etc\profile.d\aliases.sh. This is the path under windows 7, maybe can be different in other installation. Just open it with your preferred editor in admin mode. After save it, reload your command prompt. I hope this can help! git config --global alias.cm "commit -m"
Open Command Prompt and goto C:\Users\USERNAME\. It generates the .bashrc file. 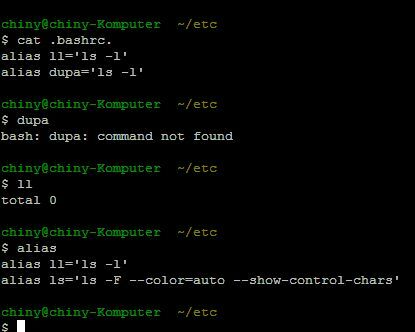 Add below sample commands of WP CLI, Git, Grunt & PHPCS etc. ga instead of git add. Eg. I have used wpthl for the WP CLI command wp theme list. Note: [ desk ] can be what ever name that you choose and should get you to the location you want to get to when typed in the CMD window. There is two easy way to set the alias. It will eventually add those aliases on .gitconfig file. Not the answer you're looking for? Browse other questions tagged git bash or ask your own question.